Difference between revisions of "Gyration-based MCE Remotes"
There are a number of ways to get the remote working on Linux: evrouter, xbind, and lirc. There are a number of ways to get the remote working on Linux: xmodmap, xbind, evrouter, and lirc. arrows and number keys. The mouse functionality also works out of the box. really ought to understand out of the box, but doesn't. Using [xmodmap] is a simple way to work around that. the menu key doesn't do anything in PC mode, so you can't re-program it. not just mythtv. This mapping really should be handled at the mythtv level. 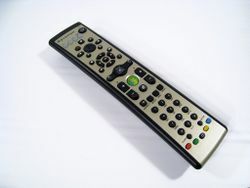 Gyration-based remotes operate over long distances (more than a room away) via RF. No line of site or IR is required. They can be programmed to control IR devices as well (push a button to switch mode). They are sold under the following branding: Gyration, Dell Premium, and Fiire Chief. Product Type 2 is officially supported starting in Linux kernel 2.6.27, while Type 3 is officially supported starting with 2.6.28. Also some of the buttons (SETUP MENU and INPUT) are not intended to send RF codes, according to someone that has spoken with Gyration. The LAST button may only send IR codes on type 2 products, but has been confirmed to send RF code on type 3. An "in-the-air" gyroscopic mouse + media center remote, without LCD. N: Name="Gyration Gyration RF Technology Receiver"
A re-branded GYR3101, called the Fiire Chief, is offered by Fiire with custom firmware that adds a "follow-me" feature when used with LinuxMCE. Also referred to as the Air Music Remote, this unit was originally called the Gyration Ultra R4000, and was actually released after the below mentioned Dell remote that was designed for their M2010 system. It has an LCD read-out. LinuxMCE now supports this device. A Dell-branded Gyration remote with small LCD is optional with the Dell M2010 computer system. The remote is p/n WJ151 or RY496. The USB portion is contained on a custom PCB (p/n RH515) which has a non-standard USB pinout. RH515 is no longer available, and instead, a package containing both the remote and a real USB dongle with standard USB pinout can found via Dell p/n CX071. The unit uses the Cypress CYWUSB6934-48LFXC for RF communications, which is NOT compliant with wireless USB. 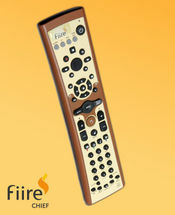 The microcontroller and USB interface is handled by a CY7C63743-QXC "enCoRe USB" device. Note that some of the keys work out of the box. These include the arrows and number keys. The mouse functionality also works out of the box. Some keys work out of the box. Other keys send standard sequences that mythtv really ought to understand out of the box, but doesn't. Using [xmodmap] is a simple way to work around that. Apparently, only the standard MCE keys send out an RF signal - for example the menu key doesn't do anything in PC mode, so you can't re-program it. A downside of this approach is that you're changing the bindings for *all* applications, not just mythtv. This mapping really should be handled at the mythtv level. We should probably copy the solution described in the Ubuntu forum. (steps are based upon the info from Adam Pierce's blog). Preliminary /etc/lirc/lircd.conf for the Gyration remotes follows. #    for Gyration MCE remote(s). Could almost certainly be expanded to work for their keyboard as well. Home                     0x0066 # AKA "Windows button"
RecTV                    0x00A7  #Not "recorded TV", but "record current show on TV"